Vision_Editor : #socialrecruiting is a relatively new phenomenon. How are companies using it? Jacques Froissant founded Altaïde in 2000. This consultancy specializes in providing HR services for innovative companies in the Internet, Web 2.0, mobile internet and software sectors, making use of blogs and tools made available with the advent of Web 2.0 to boost the recruitment process for start-ups. To be visible online, these community forums cannot ignore a few standard principles: optimizing search engine visibility, using relevant keywords, and creating links from the corporate site and career websites and the company’s page on Facebook, Twitter or LinkedIn. Running communities such as these means abandoning the traditional patterns of communication. The point is not to advertise vacancies; most companies have careers sites and already make use of job boards. It is all about being proactive, engaging potential candidates in dialog early on and forming a talent pool with an eye on positions that might not even exist yet. Community management around the employer brand is therefore emerging as a new activity within HR departments. Methods to stimulate interest group activities or, quite simply, further enhance a company’s image on the Web are gradually emerging. The required actions no longer rely on recruitment experts seconded to HR departments, but potentially on the entire community of employees and their ability to create momentum as web users. Already active on social networks, these employees are in an ideal position to act as ambassadors for their company. It may even be in their own professional interest. The point is not to advertise vacancies. 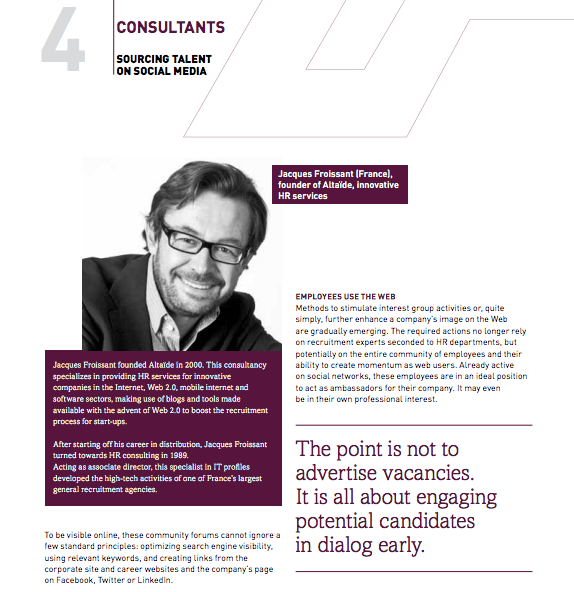 It is all about engaging potential candidates in dialog early. After all, it is not unreasonable to ask a sales manager to activate his network as a quick means of recruiting the resources he needs to achieve his objectives. What would be illogical, on the other hand, would be to deprive him of the keys to using social media effectively. Similarly, it would be in the interest of all the members of an IT development team with an ever-growing workload to speed up the arrival of new recruits. That, however, can only be done if the information is spread on the Web with optimal organization and coherence. At the initiative of HR teams, specific training courses in the use of LinkedIn, Twitter and any other appropriate tools for company employees are thus emerging. “We are even introducing motivation programs on the use of social media,” adds Jacques Froissant. Yet in inciting their employees to be active on the Web and reveal their expertise along with the image of their employers, is there not a danger of their being snapped up by other recruiters? This question is clearly justified, but the answer is as simple as looking up the name of the person in the next office on Google! Employees don’t wait for their boss’s permission to sign up to LinkedIn, or join interest groups on Facebook. “They’re already on these networks, and that’s the very reason why we’re tapping into them!” says Jacques Froissant with a smile. Besides, even when used for professional reasons, the Internet does not have much time for protectionism. Without advocating sharing everything online, those who don’t contribute to activities on social networks have little chance of unearthing valuable information. company’s recruitment culture,” claims Jacco Valkenburg, international recruitment consultant and author of two books on LinkedIn. Clearly, using social media pushes boundaries and creates new roles for HR teams. In particular, it is up to them to choose which social media they want to use and create optimal conditions for a sustained, dynamic online representation of the company and its employer brand – or even go as far as running and moderating special interest forums. Naturally, the results of a company’s “digital” strategy must be measured. Consultants agree on the need to take time to set it up and make minor readjustments before rushing into using indicators (see box). Yet once a strategy has been in place for a while, the number of spontaneous applications sent in by people who have discovered the employer’s brand on the Web or were attracted by it, is no doubt the best proof of its success. The consultants we have interviewed insist that it is vital to select targeted online communities to promote the employer brand. They also add that the most important thing is to initiate a dialog, as opposed to merely taking up a position there as if one were advertising. However, they also agree that it would be unwise to draw hasty conclusions based on first attempts. Even with good preparation, there is still uncertainty with regards to what a company will get out of exposing its employer brand on social media. Six months of observation are required to ensure that the right information gets delivered to the right people. During this transitional period, overlook markers such as “Like”s on Facebook, “Followers” on Twitter, contributions and reactions to a blog, etc. Take advantage of these six months: spend as much time honing your strategy as you do feeling your way around and searching for new leads. Wait until the end of this period to start examining the statistics, such as the number of suitable profiles found, applications received and people hired. “Establishing an employer brand on the Web requires time and energy devoted to the process as well as digital marketing skills,” Jacques Froissant underlines. The rewards of this investment can be measured on a medium-term basis by the quality of the talent pool and the company’s enhanced agility in a competitive job market. For when the statistics finally do talk, they reveal just how efficient social networks are in helping with recruitment. Interview donnée pour le site Worldwide d’ADP www.es-international.adp.com PDF complet ici.